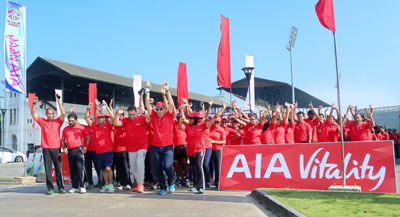 Asia’s leading insurer AIA’s ‘Vitality programme’ is the newest, most rewarding wellness platform in Sri Lanka, aimed at making Sri Lankans healthier, one step at a time. It’s a first-of-its-kind, science-backed wellness programme that provides participants with the knowledge, tools and motivation to improve their health. It’s an easy-to-use application that can be downloaded for free from the Google Play store or the Apple App Store. Once you register, it lets you calculate your Vitality age (body age) – but be warned, you may be older than you expect! You will be given ‘step targets’ to earn ‘vitality points’ and if you achieve your targets AIA will reward you.